Thin Mini-ITX based all-in-one PC chassis are available in a variety of stylish, capable designs. There are many optional, innovative features including 10-finger multi-touch, dual microphones, high resolution web cameras, and VESA mount capability that can be combined with capable, Thin Mini-ITX desktop boards and compatible components to meet specific computing needs. Select the right chassis, desktop board, and components to support features and meet compute needs. 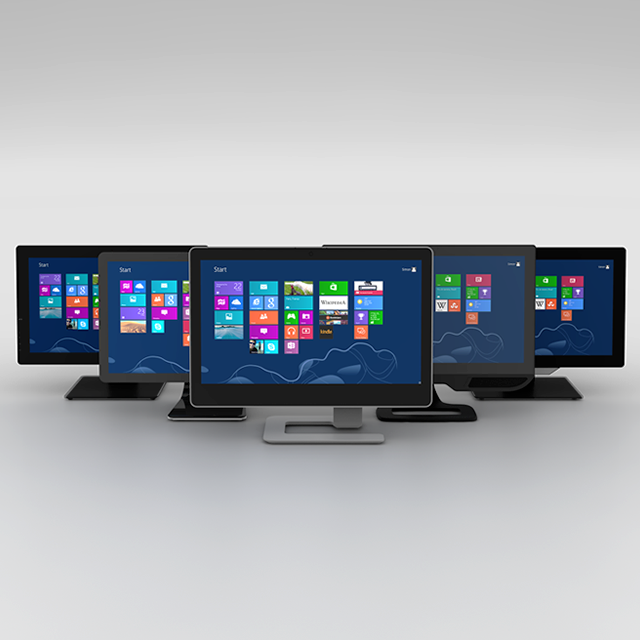 Many all-in-one PCs can include touch screens, web cameras, and audio while supporting high speed connectivity to other devices via wireless networking, Gigabit Ethernet, and USB3. The compact compelling design of all-in-one PCs, which can be integrated using a number of standard computing components, allows you to customize your computing experience without sacrificing choice, system response or style. Choose a Thin Mini-ITX-based all-in-one PC chassis that is compatible with the right component mix to enable specific customer solutions. Plan for future upgrades based the options available with the specific all-in-one PC. Choose an all-in-one PC with a 10-point multi-touch screen and experience new levels of interactivity with games and media. Use the increasing range of touch enabled applications for a higher level of interactivity and function from your all-in-one PC. There is a wide range of Thin Mini-ITX-based all-in-one PCs to choose from. Design variations include frame- and pedestal-based designs that vary in shape, size, and supported features. This promotes solutions design that includes addressing aesthetic needs and appeal for specific environments. The all-in-one PC chassis choice defines a number of key features for the system being integrated. Combine the Thin Mini-ITX-based all-in-one PC chassis style with compatible components to support desired functionality. Many all-in-one PCs, whether frame- or pedestal- based, are VESA mount compatible. This provides the opportunity to mount the compact, all-in-one PC in many different locations based on the wall or desk-mount capability. Animated slow motion thin mini-ITX desktop board construction for many usage models. Steps for integration, servicing, and upgrading the LG 22AM33NB* all-in-one PC. Steps for integration, servicing, and upgrading the Loop LP-2150* all-in-one PC. Steps for integration, servicing, and upgrading the Loop LP-2151* all-in-one PC. Never clean your PC again—with an Intel® NUC from Logic Supply, no fans mean no cleanup.